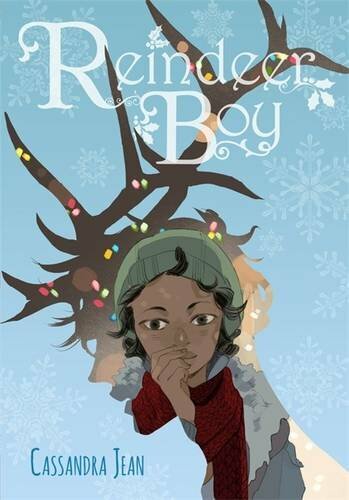 Book Posts - Reindeer Boy — Comic Art Ed! Comic recommendations for young readers, educators and librarians. Hello everyone! Welcome to my second post on Comics Art Ed. This is another book recommendation post for teens, educators and caregivers. It's a charming romance, my favorite! Enjoy! -Cathy G.
Intro: Reindeer Boy is a charming high school romantic comedy with a magical realism flavor. Don't let this Christmas-themed comic put you off, it's a fun read any time of the year! Its fresh, clean style emphasizes the cute designs of the characters, with a lovely hint of fantasy. Story Summary: It's Christmas, and Quincy always looks forward to her presents, including the strange small one she gets every year wrapped in tin foil. This Christmas also offered another surprise: a smack on the head! With throbbing bumps on her forehead, Quincy goes back to school to see a strange new boy, Cupid, has enrolled... and he has antlers growing out of his skull. Cupid has brought along other new strange friends, who also have antlers. Who are these weird new kids, and why won't they leave Quincy alone?? Theme 1: Romance. This book packs a lot of cute boys + girls in less than 200 pages! The main focus of the novel is Quincy's crush on her friend Conway, and the new love triangle created by the antler-touting Cupid. It all remains emotionally sweet and brisk, which makes it a fun romantic read without a lot of emotional distress. Theme 2: Growth comes into Reindeer Boy through a number of ways, metaphorically and literally! Quincy's forehead bumps keep growing, as her friendship with the strange antlered kids also grows. Through this is a theme of self-acceptance, whether what you are accepting is new friendships, new loves, or new changes to your body. Theme 3: Trust. Chosen family and opening you heart is another huge theme of Reindeer Boy. Cupid does not have parents, but the other antlered-people act as his support network and family. Like the theme of growth, Quincy learns to trust all her new experiences. Quincy is a positive and open-hearted character who is nervous, but overcomes her fears. Should I Read It? : If you love romances, fashionable + clever character designs with a clean style, I'd give this book a try! It's a fast-paced read with a lot of heart, and its beautiful black + white artwork can be revisited again + again.